In an Oklahoma prison last night, a 38-year-old inmate began writhing and clenching his teeth after receiving the first of three lethal injections. He later died of a heart attack. The injection — compared to the hanging or the electric chair — is intended as a relatively humane way to execute the most heinous criminals. But a number of drug-makers who oppose the death penalty have stopped selling lethal drugs to American prisons, leading correctional facilities — like this one in Oklahoma — to experiment with new kinds of execution drugs that could fail to meet the constitution's requirement that punishment be neither cruel nor unusual. Austin Sarat, professor of jurisprudence, political science director of student-faculty research and associate dean of the faculty at Amherst College. Visiting senior scholar at the University of Alabama School of Law. Author of the new book, out Wednesday, "Gruesome Spectacles: Botched Executions and America's Death Penalty." Austin Sarat: "The fact that the execution was botched is not, in and of itself, a surprise to me. What is a little surprising to me is the boldness with which states in the United States, who are so wedded to executions, are now experimenting. It's as if the scene of execution was a scene of human experimentation in which drugs — drug cocktails, drug combinations — previously untested and unreliable are administered to human beings in the hope that what they will produce will be a humane execution. What we witnessed last night in Oklahoma is the way that hope is belied. And the execution in Oklahoma, I think, is a particularly dramatic and vivid example of what happens when executions in the United States go wrong." AS: "The overall rate, when you look at every execution between 1890 and 2010, the rate at which executions were botched was about 3 percent. That is every type of method — hanging, the firing squad, electrocution, the gas chamber and lethal injection. The overall rate was about 3 percent. Lethal injection, the rate is higher. It's 7 percent. Lethal injection is, in many ways, a very complicated procedure. It can be botched if the people who are attempting to administer the lethal injection can't find a vein. It can be botched if, on the administration of the drug, the inmate, the condemned, has an adverse reaction to the drug. It can be botched if the line carrying the lethal substance gets stuck. A botched execution is to an execution what an accident in a hospital room is to a surgery — it's not surprising they happen the more complicated the surgery, it's not surprising that the rate is somewhat higher and, in fact, if you look at the 20th century in the United States there's an interesting story to tell about botched executions. That's a story about what might be called technological hope. At every turn, from hanging to electrocution, from electrocution to lethal gas, from lethal gas to lethal injection, the same story has been told, and it's been a story of how this new technology would reliably and effectively deliver on the promise that death would be death and not more than that. That death could be administered in a way that imposed — and this is the language of the Supreme Court — 'no more pain than is necessary.' And the story that we tell in the book, the story that I try to get across in the book, is a story that should be familiar to Americans, and that is a story of the promise of technology, but also its failures. We have yet to find a reliable and foolproof technology for getting people from life to death in a way that ensures that they will not suffer and they will not suffer in ways that raise constitutional questions." AS: "I think it's an indication that proponents of the death penalty in the United States are on the defensive. I think it's an indication that, in the face of the doubts that many Americans now have about the viability of the death penalty and its compatibility with American values, those are signs of desperation — a little bit like swimming upstream in the hope that you'll find a safe shore. I think there is no technology over the horizon that holds the promise that we've attached to lethal injection, and before it gas and before it electrocution — there is no emerging technology that promises to do it better than lethal injection. Justice Scalia famously said in a capital case, comparing the crime to the punishment, 'How enviable a quiet death by lethal injection.' Well, that may be the promise of lethal injection, but that is not the practice of lethal injection. And the resort to other methods, going back to the firing squad or electrocution, is not going to produce quiet death at all." AS: "The test of a society like our own is, what can and what should we do in the face of justifiable anger at heinous crimes? I don't underestimate the heinousness of the crime that he committed. I don't underestimate the seriousness of the damage, the unspeakable suffering that capital crimes produce. But when we punish, the question that we're asking is who we are and who we want to be. Do we want to be like the people that we condemn or do we want to say that there's nothing that they can do that will lead us to violate our own deepest moral and legal values. I hope the answer to that question is, we won't give into the temptation to respond to them in light of the seriousness and heinousness of the crimes that they've committed." "Using newspaper accounts and a database of all American executions, my collaborators and I recently completed the first comprehensive study of botched executions in the United States and documented the ways that different methods of execution go wrong. We examined every execution from 1890 to 2010 and found that no technology has been able to ensure that capital punishment would not, on occasion, become either a gruesome spectacle of suffering or a messy display of incompetence." 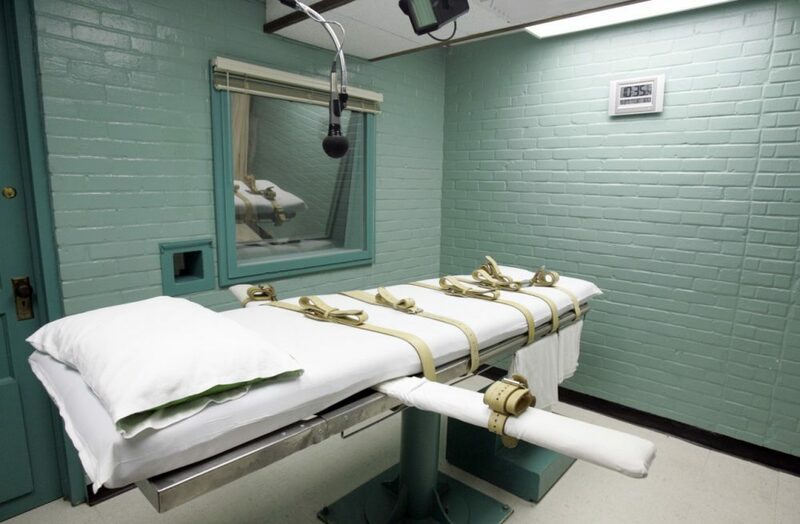 "As Eyder has reported, death row inmates in different states have asked judges to delay their executions based on questions about lethal injection drugs. Some courts — including the U.S. Supreme Court — have refused to step in, and executions have proceeded." "New Hampshire has just failed to abolish the death penalty—by one vote.Given that the Granite State has not actually executed anyone since 1939, you might think this doesn’t matter much. But, obviously, it matters to the one man on death row in New Hampshire, a cop-killer called Michael Addison." This segment aired on April 30, 2014.